Fiat introduced the Punto hatch back in the year 2009 and it was a good looking hatch and why it won’t be Italians are always known for their passion for cars and their impressive car designs. The company seems to have concentrated more on the looks and has given the car some new colours. The powerhouse of this car was known for its performance in India. With a neatly sculpted long body, the small car is capable of winning the hearts of customers for its beauty, comfort and performance as well. There are about seven variants from which a customer can make a choice. 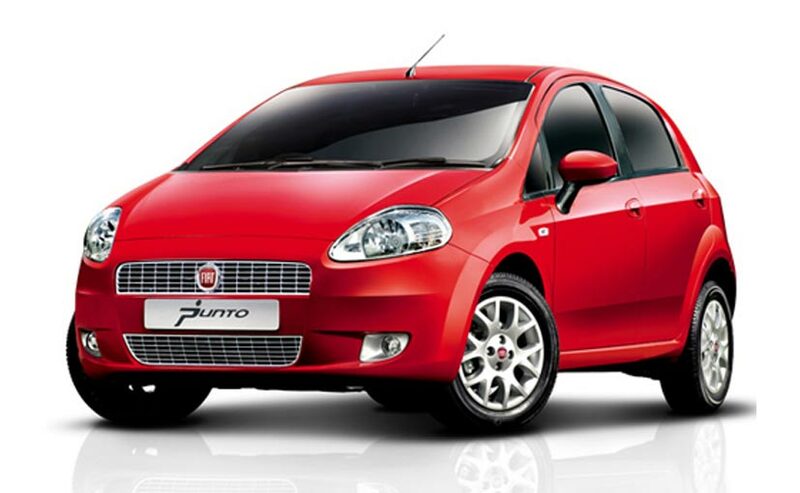 Fiat Punto is available in both petrol and diesel variants with revolutionary engines. Fiat Punto is available in seven variants: Active, Emotion, Dynamic and 90 HP Diesel) with a choice of petrol and diesel engine. The Punto now comes with an option of 1.2 L FIRE Petrol, 1.4 L FIRE Petrol, 1.3 L MULTIJET Diesel and 1.3 L Advanced MULTIJET Diesel engines. The 1.2 L FIRE Petrol engine delivers a max power of 67 bhp @ 6000 and a max torque of 96 [email protected] 2500 rpm and the 1.4 L FIRE Petrol engine delivers a max power of 88.7 bhp and a max torque of 115 Nm @ 4500 rpm. The 1.3 L MULTIJET Diesel engine pumps out 74.9 bhp of Max power and 197 Nm @ 1750 rpm. The 1.3 L Advanced MULTIJET Diesel engine pumps out 91.7 bhp of Max power and 209 Nm @ 2000 rpm. The range of petrol engine delivers thrilling driving experience without any compromise on performance and mileage. As of ride quality, The car comes with power steering and the wheels are coupled with the body through a suspension system that offers good comfort. The 19.5 cm tubeless tyres are mounted on alloy wheels. The car has a high ground clearance making it suitable for cities with bad road conditions as well. The front tyres are mounted with disc brakes and the rear ones with drum brakes. The car energised by the engines from two popular Fiat engine families would surely not let the customers down. As per safety, it equipped with ABS which works with EDB where an electronic control unit is responsible for proper sharing of braking force to the wheels in a manner to avoid skidding. The Fire Prevention System and the air bags to both seats in the front are some of the features which are responsible for avoiding injuries and major damage when an accident occurs. Further, there are many indicators and sensors that prevent the needless hazardous situation like the door open indicator. The FPS in this Fiat car is actually a whole package which is featured to avoid fire dangers when there is a crash. The model has come back with a ground clearance of 190 mm which is very high for a car of this body type. This change makes a buyer breathe easy while running over a bump while the increase in height does not affect the look of the car. The model has body coloured bumpers, a pointed headlamp cowl, radiator grill running from the nose to the bumper of the car at the front and a neatly cut rear quarter panel which pushes up the tail lamp close to the roof of the car. The car also gives a lot of room for luggage with a huge volume 280 litre hidden under the boot lid. The interior of this basic model although does not have many features but is carved into a good design with good seating comfort on both front and rear seats. The seats have head rests and are the seats are positioned in a manner to give good thigh support. The drive gets a tilt adjustable steering wheel and a dedicated foot rest next to the clutch which for his/her comfort. The information cluster gives basic gauging like speed, revolutions etc in mechanical form and the indications on the trip, digital clock and customizable speed limit warning in a digital format. An audio system connected to four speakers can play radio, MP3 and CDs to entertain the interior. Some of the other noted points about its interiors are HVAC, rear foot level AC vents, speed sensitive volume control and clutch foot rest. The digital unit gives information on fuel consumption at average and current speeds, trip measurements, external temperature indicator and a speed level warning function where the speed can be set by the user. All the windows can be opened and closed using switches. Standard features are electric door mirrors, power windows, remote door opening/locking, in-cab electrical tailgate, sliding front seats with memory functions, adjustable electric dual drive power steering, and advanced car audio system. The Fiat Punto precisely appears to be standard and sporty while the fresh interiors come classy and interesting although it may not provide the most spacious interiors with all those equipment levels and the new rear AC vents it surely does feel new. The disappointing part is it looks heavier in the rear part.